iClock Pro is a menu-bar replacement for Apple’s default clock. iClock Pro is an update, total rewrite, and improvement to the popular iClock. Have the day, date, and time in different fonts and colors in the menubar. iClock is also a kind of centrally located time-hub from which many time related functions can be controlled. iClock is an essential time utility for pilots, business people, travelers, and anyone who communicates with people in other time zones. Pandoras Box 4.0.2 – Control Pandora from the menu bar. Digital Clock 3D 1.1.0 – 3D Screensavers. 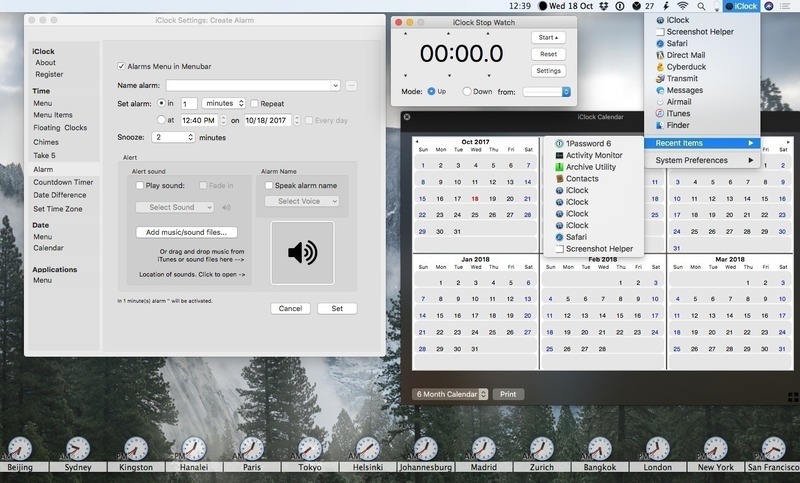 iClock 4.5.7 – Customizable menu bar clock, calendar, alarms, timezones and chimes.